DRC 2007…..not bad for a Monday! 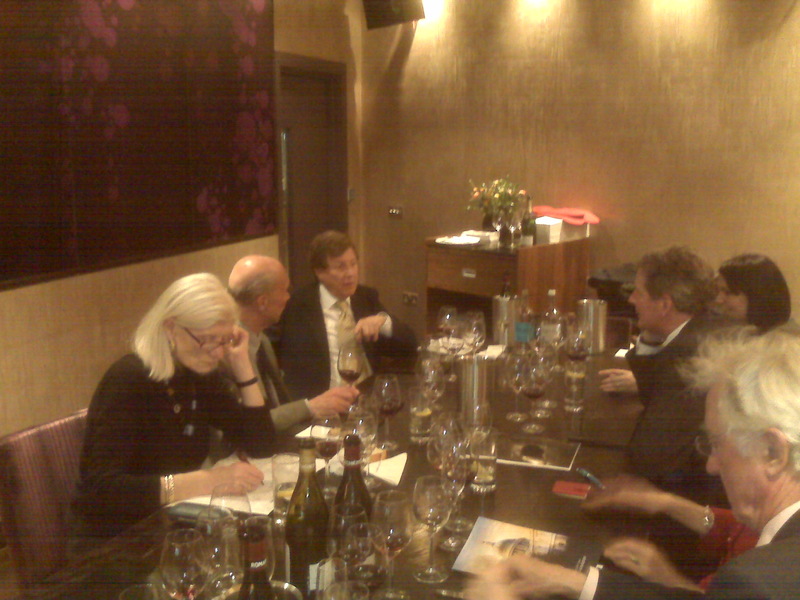 For the first time I can remember (and amazingly this was my 11th vintage) the DRC Press Tasting was on a Monday. As is traditional now the wines are shown to the press just after bottling, which was done in the last two months. The Domaine de la Romanee Conti wines are amazingly easy to taste at this young stage. I have always thought it would not be the case even as little as 3 months later when they start to become constrained by bottling. It’s always a massively exciting tasting regardless of the vintage as you are dealing with the very essence of terroir. 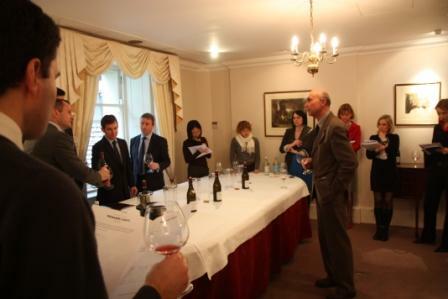 The tasting takes a relaxed yet studious tone, there is very little talking at all, whilst Aubert is almost always in attendance, as he was again this year, there is no speech or presentation. The wines are “left” to do the talking themselves. The wines (no Vosnee Romanee 1er Cru Duvault Blochet this year) are tasted in the order below with the Montrachet never shown (more of that later! 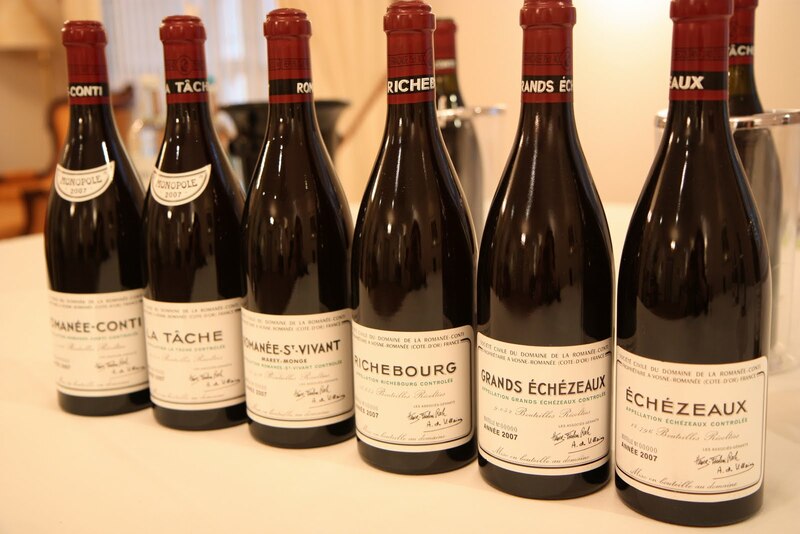 ), the notes are my own and brief….I’m not a massive fan of scores so there aren’t any….each wine taken on its merits, it’s not a competition after all…..
Echezeaux – Beautifully “Pinot”, red fruits, elegant and feminine, good acidity and poise, long finish…very impressive. Grands Echezeaux – Immediately less obvious than Echezeaux, fruit red again with a hint of something darker, a leafy note and more impressive on the palate than nose at this stage. Richebourg – As with last year tasted before the Romanee-St-Vivant, Richebourg was more gutsy with a masculine edge, serious and more brooding to me. Romanee-St-Vivant – Classy and a little more “showy” than the others so far, red fruit again, rich and a touch decadent, the biggest (good) surprise for me. La Tache – As is often the case (almost always for me) the most obviously performing wine and, if I were pressed, the most impressive, richness and splendor combined, brilliant texture, hidden structure too. Romanee Conti – The nose showed more than some years, exquisite balance and harmony, palate tighter and giving less away…so impressive and true. With the tasting over before 12.30 it was brilliant to have a brief window for Aubert to present the wines and vintage to the entire C&B Team, the samples were minute – it’s amazing how far a bottle can go – the entire press and home team requiring less that 2 bottles of each wine!! Aubert is always clam when speaking and manages to make something very complex sound simple. “A vintage that will be for the nose” being one of the more memorable quotes. From 1 Thomas More Street those that were lunching – Adam, Alison, Rachel and & I were hosting Aubert, Serena Sutcliffe MW, Anthony Hanson MW & Remington Norman MW – moved on to Lunch at C&B Paternoster Square. The post tasting Lunch has been a tradition, a massive personal highlight, and a thank you to Aubert for as long as I can remember. It is a good chance t o relax and get the views of some of the wine world’s biggest names. Exciting though this is for me there is nothing to rival the fact that we now taste the Le M ontrachet 2007 at lunch. The 2007 was a spectacular wine, especially when you consider it was the last picked of the wines (17th September) and you can well see it. A gorgeous young gold colour and exotic nose, to make an almost farcical comparison it reminded me of the 2005 with a dash more zest and acidity…you could drink it now or at anytime over the next ?? years….as Adam’s tasting note says, Noble Wine. 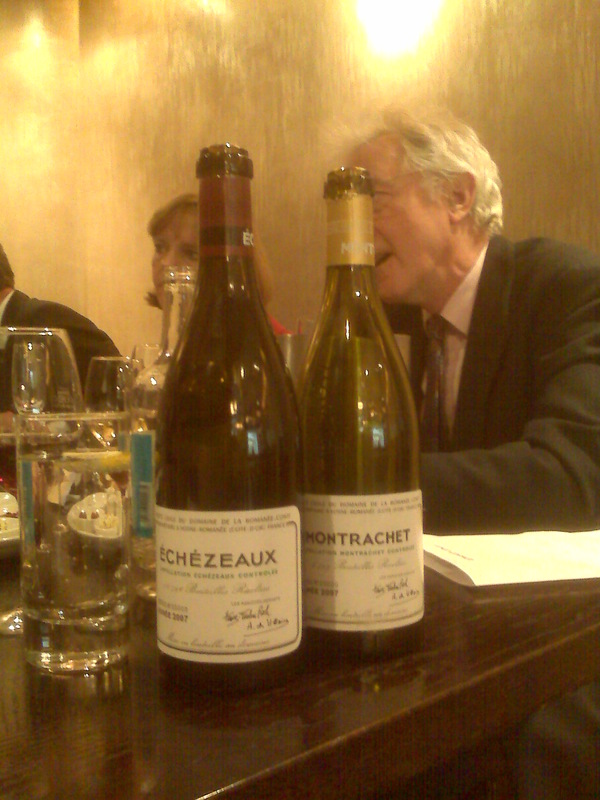 The other wines at lunch were the 2007 Echezeaux, Romanee-St-Vivant & La Tache. In particular the La Tache shone again for me. Conversation flowed – everything from the Hospice auction to Le Corton to the En Primeur 2009 campaign in Bordeaux – but one question I wanted to ask Aubert, because we get asked it a lot, was which vintage the 2007 wines reminded Aubert of. He said the weather was so unique that it was hard but eventually he said a civil marriage (no churches) of 1997 and 2004. The only problem for me now is what on earth do you do on Tuesday when your Monday is that good? Next Next post: Clos de Tart 2008….